All you need now to be a successful drummer is some talent. 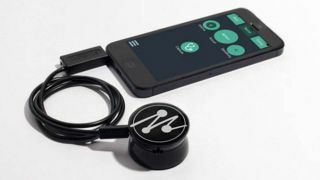 A new iPhone accessory that can turn the world into a drumkit has smashed its Kickstarter goal just a week after launching. Mogees is essentially a vibration sensor - stick it onto the side of any object and it will detect when you bash, scrape or pluck the object. Then using your phone you can apply certain sounds or notes to each gesture, and all of a sudden your coffee table has become a drum machine. The Telegraph notes that what appears to have propelled Mogees to its sudden success raising over £52,000 - more than double what the creators were looking for - was a video of a door being turned into a drum-kit, which has received over 40,000 views in a single day. The app itself supports a number of different "sound engines" which enable you to tweak the sound output to make exactly the noise you're looking for, and it also works as a MIDI controller so you can genuinely compose your next smash-hit track by drumming on your fridge if you want to. The Kickstarter still has 21 days left to run and if you want to secure yourself a device you'll need to commit £95 or more - but the good news is that you can expect delivery relatively soon - in November.